MH370 debris believed spotted by Australia. Now the search for the black box begins. Missing Airliner Debris Believed Spotted. But Answers Could Still Be Years Away. 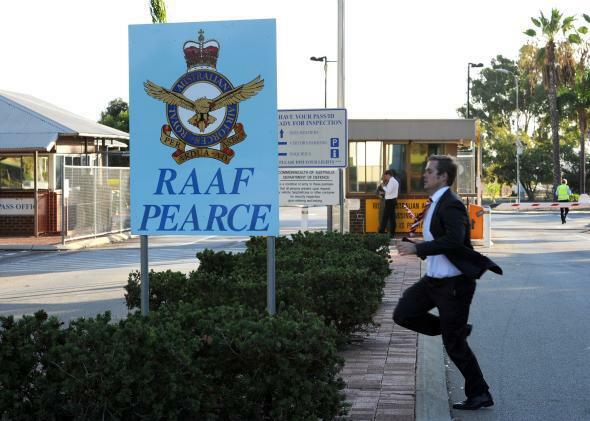 A member of the media runs past the entrance of Royal Australian Air Force Base Pearce as air force flights search for Malaysia Airlines flight MH370 in the Indian Ocean. Australian authorities have announced that satellite images taken of a stretch of ocean 1,550 miles southwest of Perth, Australia, are believed to show floating debris that could be part of missing Malaysia Airlines Flight 370. “It is probably the best lead we have right now,” said John Young, a spokesman for the Australian Maritime Safety Authority. Confirmation of the material’s provenance will likely have to wait, however. While a merchant vessel has arrived in the area to help with the search, poor visibility has prevented search aircraft from locating the debris, and the nearest Australian Navy ship is several days’ sail away. If the debris does turn out to be from MH370, a major part of the mystery—where did the plane go?—will have been resolved. But other baffling questions will remain: Who exactly redirected the flight? How did they do it? What was their motive? Answers could remain elusive for years and indeed may never emerge. Investigators’ best hope is to find the so-called “black box,” which in reality consists of a pair of orange-colored, shock- and temperature-resistant devices. One, the Flight Data Recorder, digitally encodes information about the plane and its relationship to the environment, including airspeed, angle of attack, and pilot inputs. The other, the Cockpit Voice Recorder, provides an audio record of what was said and what occurred in the cockpit. Together, these two types of information can allow investigators to piece together a narrative of how a plane crash unfolded. The search for Air France 447 offers a useful template for how investigators can whittle away at the seemingly unsolvable mystery of a midocean airliner disappearance. After the Airbus A330 went missing over the middle of the equatorial Atlantic in 2009, search aircraft took just one day to locate the first pieces of floating wreckage. The recovery of the black box, however, took another painstaking two years, and a full assessment of its implications another year after that. The first step after determining the debris’ location is to call in the mathematicians. Based on all the data available—the aircraft’s last known position, route of flight, altitude, prevailing winds, sea currents, ocean depth, and so on—a probability is assigned to each variable, and a distribution map of probable locations on the sea floor is generated. Searchers can then deploy their underwater assets to scour the vastness of the deep, working back and forth along grid lines laid out in the areas of maximum probability. There’s a deep problem inherent in this approach, however, and it’s that the probabilities are themselves only guesses. Searchers are uncertain even as to the extent of their own uncertainty. In the case of Air France 447, the set of base-set assumptions turned out to be wrong, and the first two search seasons scoured thousands of square miles in vain. The missteps of the AF447 search process, while frustrating at the time, will help today’s searchers perform much more efficiently. At the beginning of the former process, for instance, authorities deployed a wide variety of underwater assets, including the French nuclear submarine Émeraude, the deep-diving manned research submersible Nautile, and phased-array sonar equipment towed behind ships. All turned out to be flawed for searching the deep sea bed. The nuclear sub was designed for tracking vessels, not scouring the ocean floor. Nautile, while capable of exploring a given spot in great detail, was useless for surveying broad areas. The towed sonar arrays could cover great swaths, but moved at a constant depth, limiting their usefulness in a region of undersea mountain ranges. What turned the tide for AF447 searchers, in the end, was better math and better undersea technology. A recalculation of the location probabilities using a different mathematical approach led to the redrawing of the search grids much closer to the site of the plane’s disappearance. And a new type of autonomous undersea vehicle—a robot sub, in other words—became available for the first time. Called Remus 6000, these subs were able to navigate on their own along precise grid lines, ascending and diving to match the contours of the undersea terrain. On April 3, 2011, less than a week after the refined search began, one of the three submersibles deployed in the search returned to its mother ship bearing images of a debris field scattered across an abyssal plain. AF447 had been found. A month later another type of unmanned submersible brought the black boxes to the surface. Today’s investigators will benefit from the lessons learned in the Air France recovery effort, but they will also face challenges the earlier investigators didn’t. The stretch of ocean that they’ll be searching, for instance, is rougher, deeper, and even more remote. Their understanding of the aircraft’s last known location is far sketchier. And the debris (if indeed it is debris, and this whole discussion isn’t moot) has been drifting for weeks instead of days. If they are able to narrow the search area down to a reasonable size quickly, the magnitude of the task facing them will be considerably smaller. The flight data recorder contains an acoustic pinger that is designed to function at depths of up to 20,000 feet for at least 30 days. Detecting that ping will allow searchers to zoom in on the missing data right away, which means they could be pulled from the sea in days instead of years. But just because a black box is returned to the surface doesn’t mean that answers will be forthcoming anytime soon. Just as in an active criminal investigation, aircraft accident investigators’ primary responsibility is to ensure the integrity of the process, not to satisfy the curiosity of the public. In other words, they tend to be secretive. In the case of Air France 447, after investigators began analyzing the black boxes only dribs and drabs of rumors leaked out. Not until the release of the full final report on July 5, 2012, did the full (and very strange and gripping) truth emerge, as I discussed in Popular Mechanics. This case is likely to turn out to be even stranger, and quite likely even more gripping. Of course, at this point, we don’t even know if the spotted debris comes from MH370 at all. But either way, we’ve got a long road ahead of us.